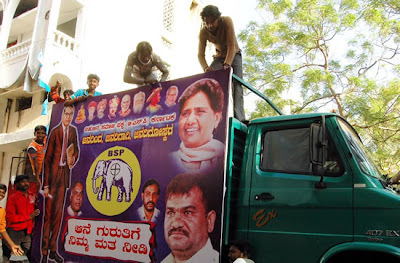 Bangalore/Mangalore: The run up to the elections in the state had starting with the first phase on 10 May there has been one factor that has been worrying the major political parties is that of the emergence of Bahujan Samaj Party (BSP). The party which was considered an underdog just before the electioneering began has now become a major contender if not to the tune of BJP and Congress it could well be in the driver's seat and could turn out to be a decisive force in the formation of the government. The major parties had discounted the BSP as a party from Uttar Pradesh and had belonged to just Dalits and backward classes, but the last few weeks had seen some interesting developments in the BSP. The major parties have started taking it seriously. The BSP has now started getting support from all quarters of the society, and leaders who have been with the other parties have started talking about the party and some of them even joined it. It could not be just the Dalit and BCs votes that will come to the rescue of the BSP but also that of the upper Hindu castes and Muslim minorities and Christian Dalits which is now worrying BJP and Congress, these were the vote banks of BJP and Congress. Just how did the BSP manage to get such a wide spectrum of vote banks? Ask Mr. Marasandra Muniyappa president of the state party unit and he says it is the "philosophy" behind party. Akka Mayawati had given the party such a legacy that the party has come out of the communal or caste circles and has launched itself on the higher social thinking where castes, communities and religion did not matter when it comes to empowerment of the people. Doling out statistics Mr.Muniyappa like seasoned politician says 24.5 dalit votes that are in Karnataka did not have a direction till the advent of BSP but now they do have an option in BSP - they were till now the Congress voters and perhaps some of them in the rural areas were also bought up by the BJP and the JD(S). Mr.Muniyappa says there are instances in the last elections when BSP has made a sure dent in the vote volumes of the Congress and cites the example of Anekal reserved constituency where the BSP candidate B.Gopal polled 24,841 votes bringing down the Congress votes by 20 percent. National General Secretary of the party Veer Singh says the BSP will make an impact in not just one or two reserved constituencies but also in all of them and he hopes to get not less than 50-60 seats this elections. Whenever the next elections comes around, the party will be able to get majority to form the government on its own says Veer Singh. Will Rahul's charm work for Congress?